These days lots of homeowners try to make eco-friendly choices when it comes to hardscaping projects, but few may realize just how their choice of paving materials can affect the planet. As your family grows in size, it might be time to remodel the outdoor area to accommodate your adult children and grandkids. Entertaining a bunch of grandkids indoors can be fun but it can also feel crowded. A well-designed home exterior is the perfect solution for family time with plenty of space for everyone. Hardscaping offers many attractive features for your landscaping clients. It’s a great idea to spend time with the home owner, learning about their preferences and lifestyle to plan the project with care. Hardscaping references objects that are built into place and not easily moved if they don’t work out. Work/life balance is a challenge for professionals and entrepreneurs with a focus on career advancement or building a business. An increased workload is expected when moving up in status. Time is one of your most precious commodities. At the end of the day when you finally arrive home, the last thing on your mind is yard maintenance. Hardscaping is gaining more and more ground against traditional focused landscaping in outdoor design. Enhance your house this year with a new practical space to please adults and children alike! 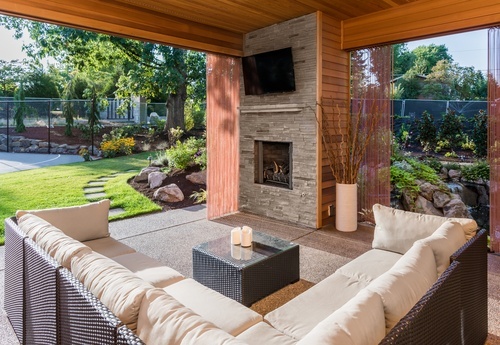 Add a playful patio to your property for improved quality family time at home. Half children’s playground and half adult patio, a playful patio allows all to spend quality time in an environmentally friendly sophisticated style that only StoneSet’s paving offers. StoneSet is an innovative green paving solution that stands the test of time with little maintenance. StoneSet is not only a cost effective solution for repairing your driveway, its uses extend far beyond where you park your car. After a busy day at the office and a long commute home, homeowners want to escape the hectic pace of life more than ever. This is why a growing number of them are looking no further than their own backyard to plan their escape. A new trend called hardscaping is inspiring homeowners to change outdoor spaces from dreary to divine.